Scientific research is used every day to help the environment. Usually, it occurs through university labs and public interest foundations, but we’d like to encourage you to do some research of your own next time you visit your favorite creek. The experiment is easy: Politely stop some passersby and ask them two questions. One, if they know what the creek’s name is, and two, if they know where its waters flow. You will be amazed by how few people can answer even one of these questions with more than a shrug or a wild guess. How will this simple exercise help the environment? After all, it has nothing to do with water quality or preserving the species that inhabit your local riparian biomes. However, measuring your community’s awareness of its watershed is a critical first step in deciding how to meet your watershed’s conservation challenges. A community that recognizes its watersheds and sees them as a valued resource is likely to make great efforts to protect its creeks and rivers. On the other hand, a community that is only aware of its creeks as “that old ditch up on Moss Street” or “that swampy drainage in the park” might not be so eager to take action when needed. There are numerous techniques you can use to raise awareness. Some activists hold events; others distribute literature to help their communities learn more about their backyard watersheds. Another incredibly effective way of raising community watershed awareness is the installation of signage pointing out the parts of a community’s watershed. Photo by Eric Allix Rogers. Watershed road signs have a number of unique advantages. First and foremost, they point out that this “old ditch” is actually an important part of their community’s natural resources. This helps create widespread knowledge in your community about the location and structure of local watersheds. Another advantage of watershed road signs is their official appearance. While we would all like to believe that people keep their watersheds clean entirely out of the goodness of their hearts, the reality is that some folks need to see an official statement before they will recognize a protected or valued area. 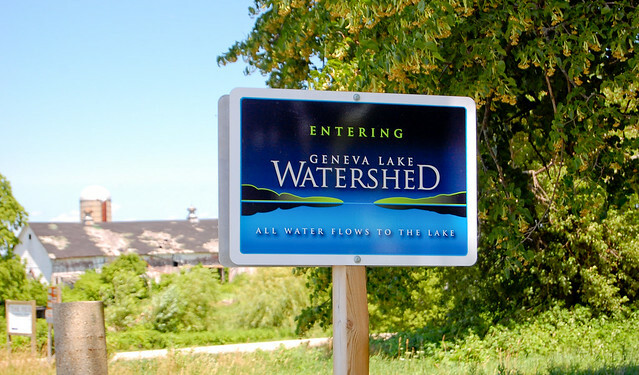 Watershed road signs help spread the message that the community’s officials stand behind the community’s dedication to keeping its watersheds clean. Lastly, a sign provides a medium for your community to send a variety of educational messages. In addition to informing people that they are walking along part of their community’s watershed, signs can educate people about key species, unique threats, and interesting natural features that occur along the creek. This kind of educational material not only raises awareness, but also draws people’s interest and may spur them to learn even more about their community’s creeks and watersheds. Educating your community about its watersheds is an endless task. Although there are numerous ways to educate people about the importance of conserving their creeks and watersheds, watershed road signs have a number of unique advantages that make them a critical part of any community education project.